The Jags entered the 2017 season with plenty of questions surrounding their starters on offense. No one was feeling more heat then QB - Blake Bortles who "didn't exactly get a ringing endorsement as Tom Coughlin, the executive vice president of football operations, wouldn't say whether the Jaguars remain committed to the player they drafted third overall in 2014." Despite a resounding lack of confidence from the organization, Bortles would out-perform Rodgers on this day. The first half brought little to speak of offensively. Despite a nice long drive to start the first quarter, the Jags would be stuffed when they came close to the goal line. After 3 unsuccessful attempts to run the ball in, Jacksonville went to play-action on 4th and goal from the 2 only to be sacked back at the 8. Green Bay finally broke the deadlock late in the first half with this ridiculous bomb in the last 2 minutes. Unfortunately for the Pack, they left too much time on the clock as the Jags would drive the field and respond with a TD of their own heading into the half. The second half was more of the same as both teams struggled to score points. 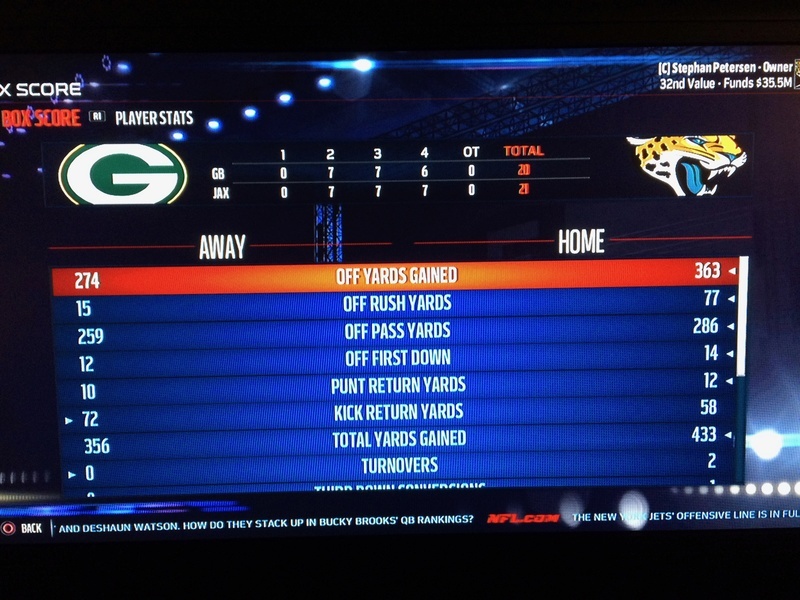 The Packers would take the league once again with a passing TD to Cobb and once again it was the Jaguars who responded driving the field and this time punching it in with RB Chris Ivory. After a couple FG's, the Packers led 20-14. With approximately 3 minutes remaining, the Jaguars were driving deep into the red zone when Bortles dropped back on a patented slant pattern and threw an INT over the middle practically spelling the of the game...or so we thought. After the Packers were stuffed on 3 straight runs all followed by JAX timeouts, the Jaguars got the ball back with 56 seconds, no timeouts and about 70 yards to go. 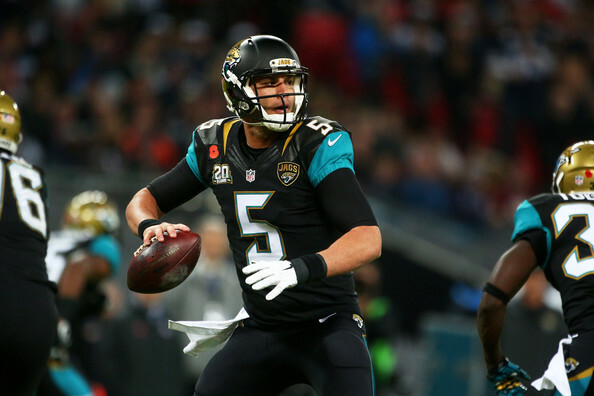 Bortles immediately hit Robinson on a huge fly to bring the Jaguars in striking distance. They would drive right down to 2 yard line, as time ticked away Bortles was trying to rush the team to the line for a play. An incomplete stopped the clock with literally 1 second on the clock. In a do or die situation, Bortles went to another patented slants pattern but this time threw it underneath to the TE in the flat and he was able to jog it into the corner of the endzone! Bortles showed some serious moxy throwing for over 290 yards. Interceptions were still a bit of an issue as highlighted earlier by his coaches but at the end of the day, Bortles threw for an admirable 62% and got the job done with a couple passing TDs.